If you wish to display information on your projects and tasks which is not included as standard in the ITM Platform environment, you can create customizable fields, in other words holders for information about projects and tasks. 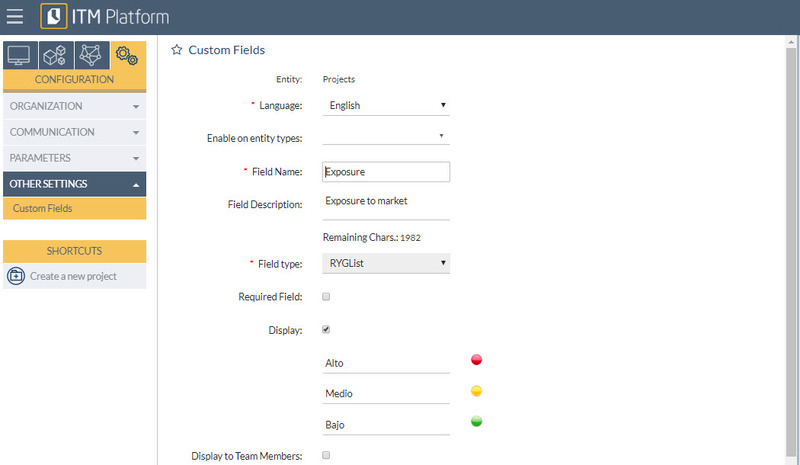 From the menu OTHER SETTING, access Custom Fields 1 and select the environment 2 of the platform where you wish to add fields, in other words whether they are fields for tasks and projects. Indicate the Field Name and Type, along with the other required fields as marked. Supplement the other values, for example whether it will be displayed on the project datasheet or will be a required use field type.